After withstanding the full force of keys and a knife, a new video shows the iPhone 6 sapphire display coming off worse against a sheet of sandpaper. 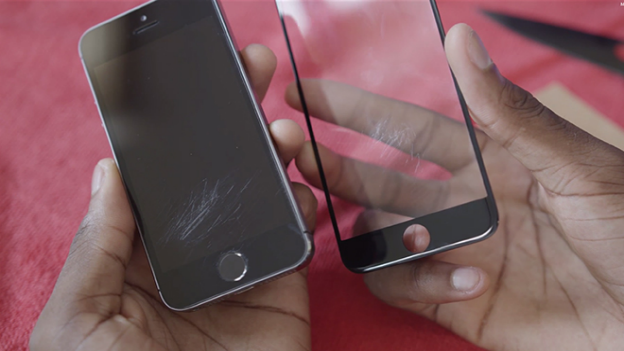 It appears the iPhone 6 sapphire display isn't entirely scratchproof after all. After previously going all out on the screen with a knife and keys doing no harm, YouTube tech blogger Marques Brownlee has released a new video testing it against sandpaper. In comparison to the normal Gorilla Glass found on the iPhone 5s, the iPhone 6 sapphire display came out better although it did clearly leave some damage. In the video Brownlee concludes that the iPhone 6 display therefore cannot be entirely made of sapphire, otherwise the sandpaper wouldn't have scratched it at all. Pure sapphire is rated higher (9/10) on the Mohl scale of hardness than sandpaper (7/10), and should not be able to mark it. The interesting thing is the Touch ID sensor on the iPhone 5S was left completely undamaged meaning it must be a purer form of sapphire than the iPhone 6 4.7-inch screen. Chances are the iPhone 6 screen is a combination of materials, mixing sapphire and a plastic component to give it its flexible and bendy qualities. Later in the video comedian Joe Rogan shows how the sapphire display wasn't built to withstand medieval weaponry either, pitting it against a bow and arrow. Check out the iPhone 6 sandpaper test in the YouTube video below.